Go on then explain to a dumbo how they work. How do business cards work? Well the idea is that you give one of these little cards to people with whom you want to continue or build a business relationship. They have your name and contact details on, so that when the person wants to contact you, they can just look at the card and see your phone number or e-mail address. OK that’s not what you meant is it? Moo.com are offering business cards printed on-demand. They have linked up with flickr, the photo-sharing site and you get to choose which of your photographs you’d like on one side of your cards. You can have 1 picture on 100 cards or 100 pictures on 1 card each or anything in between (I chose 10 x 10 – hilary clinton, snowman, waterloo bridge…etc) and you get to put in I think 4 or five lines of text on the other side. They are about half normal business card size – a long thin strip – a bit like a Paris metro ticket. They come in a matte finish on good business card stock and I love them very much. The first one I gave out was one with Hilary Clinton with a beard to someone that I was interviewing yesterday. If you have a flickr pro account you can get a sample of 10 cards free – which was where I started, but once I’d used the interface and got an idea of what was coming I decided that I could blow a tenner without waiting to see what the samples looked like. Thanks Lloyd. I am much clearer now – I had no idea what you used business cards for, apart from dropping them into an empty giant whisky bottle in a futile attempt to win a meal for 2 at your local indian restaurant!! Thank you for the information and the tip, Lloyd!! I’ll keep that in mind when choosing the pics for the cards. The other night, I sat down and went through the motions, as though I was going to purchase the cards then. (Sorted through and picked the photos, etc…so that I could get an idea of what they were all about.) After doing so, I decided to hold off a little while on purchasing them, but do have full intentions of doing so in the near future. 🙂 Thank you again. Discovered your very cool your blog this morning via Hugh’s post on Gaping Void regarding the movie preview. Will visit often. 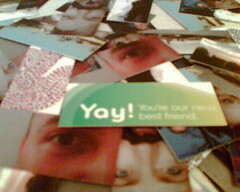 Moo cards are tres cool!